When flooring public areas, safety plays a key role in the choice of product you will choose. Some environments demand safety flooring to prevent slips and to comply with the law, which states walking surfaces must be safe. We specialise in safety floor coverings for hospitals, dentist surgeries, kitchens, toilet areas, changing rooms, and other commercial institutions. We also supply GP and veterinary surgeries, where safety flooring and hygiene is imperative. 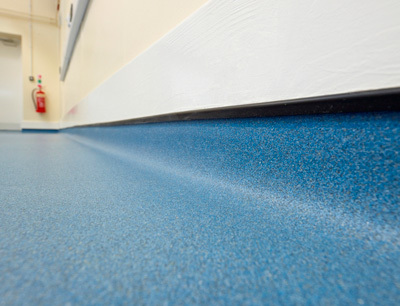 There is now a wide of safety flooring products, designs, and colours available. Safety floor coverings will need to be hard wearing, in many cases waterproof and stain resistant, and be able to withstand heavy footfall and wheeled traffic. Commercial safety flooring has increased slip resistance, in order to protect people from unnecessary accidents. It does this by incorporating aggregates into the material, in order to penetrate the wet layer caused by bad weather or spillages to provide greater grip.